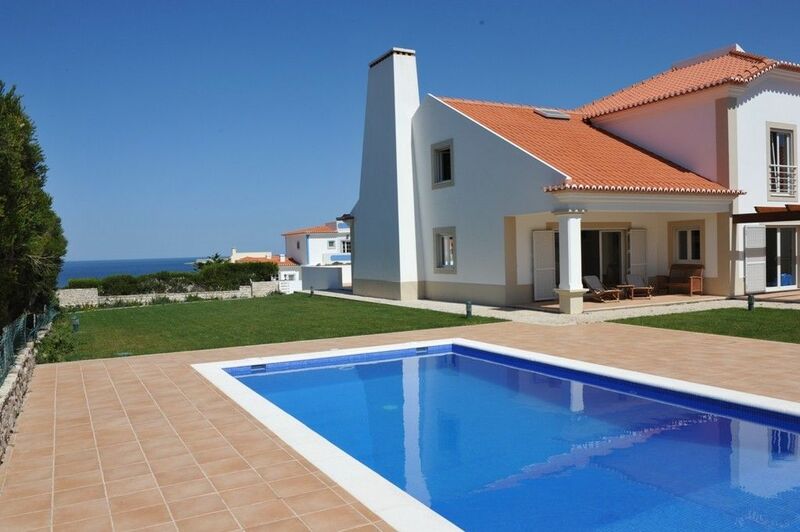 Villa with superb ocean views in Praia d'El Rey Golf & Beach Resort, w/ pool, barbecue, table tennis and BTT bikes (2). 80 m away from a wonderful beach. Excellent for summer holidays, golf weeks or weekends. Óbidos, the well-preserved medieval village is 10 km away. Lisbon airport is 45 min driving. Villa standard capacity is 8 persons. I was born in Portugal, married, 1 son and 2 daughters, MSc in mechanical engineering and spent all my professional life working on management consulting. We build the villa in 2008 as our weekend villa, but after some time I start travelling more often and then to move abroad, thus spending very few time in Portugal. So, because we are unable to enjoy the villa as often as we liked, we decided to give the opportunity for other families and friends to spend memorable times on it, as we used to. I used to play golf at the resort and one day we find this plot available and bought it and build the villa in 2008 due to outstanding location within the resort. After some years without renting the villa, we decided this year to re-list the villa for renting, due to the fact we do not have time to enjoy it. So, we are glad to share our villa to families that value holidays in unspoiled beach and inside a fantastic golf course, with everything needed for a pleasant and comfortable holidays, for adults and children. We design the villa to take advantage of the location and sea view in a relaxed, private and confortable way of living. This is not one more villa at Praia d'El Rey. When they arrive, guests use to say photos don't make justice to the house. See by yourself. A double combined fridge-freezer to accommodate food for different nr of guests. As part of resort offer. Available in the resort. Other 3 golf courses within 15 km. This was a family holiday with our young daughter (3) and our elderly grandmothers. We were all extremely impressed with the villa which was very spacious and ideally located near the beach & Marriot Hotel. Built around a golf course complex which I intend to play on our next visit in August ! Mr Domingues was very helpful with booking and all information. We had a wonderful time and enjoyed the beautiful lagoon and local historic town of Obidus. We liked the other local beaches of Baleal & Peniche which are only a short drive away. Can't wait to return again in August Mauricio ! We work hard to assure guests will get a great vacation experience and enjoy the villa and the region. Perceive guests’ satisfaction at the end of the stay is the best outcome to our efforts. Thank you for sharing your experience. You are always welcome. We are a family of 5 (2 teenagers and a 11 year old) who stayed for 2 weeks. The house was simply fantastic with everything you need for a very comfortable stay and is large enough to offer plenty of space for everyone. Although we don't play golf this was a perfectly located house very close to the beach, which has nice sand, guarded sections and good surf. The beach was almost empty of people, very nice compared to the over crowded beaches in other places. There's a mini market at the Beach Front but for a proper supermarket you can drive to Peniche or Baleal. The resort area has a couple of good restaurants and it only takes an hour to drive to downtown Lisbon. Don't miss the medieval town Óbidos. The owner was most helpful both before and during the stay. We can definitely recommend this house to our friends! We aim exceed expectations and deliver an outstanding holidays experience in our villa, to families that look for quality, comfort and appreciate quietness and nature. Is always a pleasure for us to know our efforts were fruitful. Excellent communication with Fredrik. Very kind and pleasant Swedish family. Everything perfect. You are always welcome. Thank you. the villa in praia d`El Rey is very nice. we were two families (6 persons) with 2 teenagers and stood here for nearly two weeks in July 2011. mr. mauricio was very helpful; the location is very large, the proberty was clean, even the kitchen is well-equipped, just a shower in one of the bathrooms did not work. our boys were glad about the satelitte-tv. the distance to the sea is not 80 m but very close - you can go there in a few minutes. it is nessary to have a own car, because the next bakery, or restaurants or super markets are in the next village. oppidos, a medieval city, just a view kilometers away is very beautiful! we would like to come again! Magnificas vacaciones en esta amplia villa con todas las comodidades y una situación muy buena a escasos metros de la playa. La zona es muy tranquila y segura, ademas con posibilidad de practicar diferentes deportes como golf, tenis, bike etc..
Nos encanta poner a la disposición una villa/entorno extraordinarios, proporcionando a los hospedes unas vacaciones inolvidables, para personas que les guste disfrutar la Naturaleza y las cosas buenas que la vida nos da. Este año 2008 es la primera experiencia de alquiler de nuestra villa en Praia d’El Rey. Está siendo muy agradable para nosotros compartir la casa con hospedes siempre muy simpáticos y cordiales y sentir, al final, la satisfacción generalizada de ellos y su voluntad de volver a disfrutar de nuestra villa. Wir haben in der Villa mit 4 Kindern (9 - 18 Jahre) einen sehr erholsamen Urlaub verlebt. Die Villa ist sehr großzügig und bietet soviel Platz, dass wir sogar entspannt zusätzliche Gäste zu Besuch hatten. Das Haus war sehr sauber, der Garten gepflegt und die Ausstattung perfekt. Die Kinder haben im Garten Fußball gespielt, waren im Pool und haben die Tischtennisplatte im Keller intensiv genutzt. Das Haus liegt sehr schön. Wir sind fast täglich nach Baleal(10 Minuten Fahrzeit) an den Strand gefahren zum Wellensurfen. An den restlichen Tagen haben wir verschiedene kulturelle Ausflüge gemacht, u.a. nach Obidos, Sintra, Obidos und Lissabon. So haben wir einen sehr abwechslungsreichen Urlaub verbracht, der für jede Altersgruppe ansprechend war. Der Vermieter war sehr hilfsbereit, hat uns sogar einen Internet-Zugang besorgt und ein Programm für einen Tagesbesuch in Lissabon zusammengestellt. Einziger Kritikpunkt war die nicht aktivierte Zentralheizung. Für Ende Mai waren die Temperaturen ungewöhnlich niedrig, so dass die Abende -auch im Haus- recht kühl und ungemütlich waren. Wir haben uns dann im Wohnzimmer mit Tee und Heizlüftern beholfen. Abschließend würden wir alle wieder hinfahren und können das Haus nur empfehlen. Wunderschöne Tage haben wir mit einer befreundeten Familie hier verbracht. Diese Villa bietet wirklich viel Platz und hat eine super Ausstattung. Selbst im Keller und neben dem Pool gibt es ein Duschbad mit WC. In der Garage ist neben der Tischtennisplatte ausreichend Platz für 2 Autos. Hier gibt es auch einige BMX-Räder um z.B. im Praia d'el Rey-Shop Brötchen zu holen. Gut einkaufen kann man im 20km entfernten Pingo dolce in Obidos. Der Strand (ca. 200m) ist fantastisch und wenn man mutig ist kann man sich auch mal in die Wellen stürzen. Der (Mail-)Kontakt mit dem Vermieter (auf Englisch) war sehr gut. Mauricio ist ein toller Gastgeber und wies uns vor Ort ein. Als ich nach einer Luftpumpe für die Fahrräder fragte brachte er diese mit einigen Pool-Goodies für die Kinder vorbei! Nach der Hälfte unseres Aufenthalts wurden Handtücher (inkl. Pool-/Strandtücher) und Bettwäsche gewechselt sowie die Bäder gereinigt. ansonsten ein phantastisches Haus mit einem tollen Preis-/Leistungsverhältnis. The Villa as the Praia d'El Rey Golf & Beach Resort are located in Costa de Prata (Silver Coast), the west touristic region of Portugal, above Lisbon. The villa is located 7 km from the World Heritage medieval village Óbidos and some typical fishing villages, like Peniche (12 km), Nazaré (25 km) and S. Martinho do Porto (20 km). The Monastery of Alcobaça (40 km) from the XII century is world heritage by UNESCO, and the most important abbey of Cister in Europe. Óbidos medieval preserved village is mandatory for a tour.